Peacock Colour Picker is a compact colour picking tool designed to let you pick the exact colour value of any pixel available on your screen. It is a good tool for web designers, web developers and programmers as it also offers some advanced features for analysing and mixing colours. 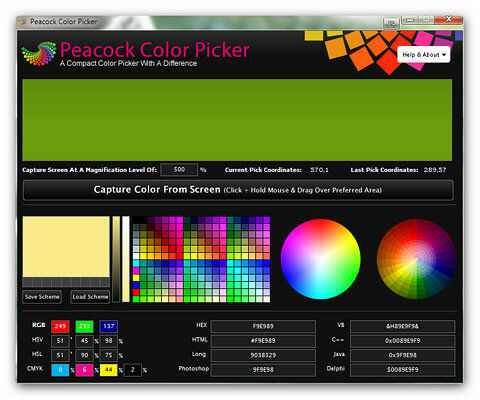 In addition to the usual RGB, HTML, CMYK or HEX colour codes, Peacock Colour Picker supports colour values for a large number of programming languages and systems, for example Visual Basic, Java, Delph and C++ -or photo editing software such as Photoshop. As with any colour picker, you can select any colour on your screen, obtain the corresponding code and copy and paste the colour value. As soon as you click on the ‘Capture Colour’ button, the application window gently fades to leave you with an unobstructed view of your screen: simply point the cursor on the area where you want to pick a colour and click. The given area of the screen is now captured and displayed at the top of the application window to let you extract any colour value. This is great if you need to extract several colour values on a same image. The default magnification level is 100% but if you need to select a colour with maximum precision, you can capture the screen with a higher magnification level (up to 10,000% apparently! ), allowing you to work at pixel level to pinpoint the exact color you want. Lastly, Peacock Colour Picker also features a colour mixing palettes and a colour scheme analyser so you can create, analyse, import and export colour schemes.